I took the eye off of Turnip's pic (see the post just below this) and played with ImageWell, a tiny editing app from Xtralean. There is a free version and an "extra" version for $14.95. 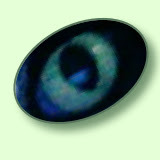 I can barely remember how I made this eye because I randomly click things without a plan. But after doing it a few more times I'll figure out what I did. Crop in Imagewell seems to be the powerhouse of the app. Crop masks the parts of the photo you want to get rid of. In GIMP you cut and paste onto a canvas and then move the image around for the mask. This stuff keeps me busy. Biopsy on Monday morning. Got to keep my mind busy. Well done, the eye is very effective, but it's all a bit too technical for me. I"m too left-brained, I think. Have a great St Patrick's Day.